That's just one of several pranksters who found themselves on the winning side of a joke, tracked down by The Daily Intelligencer and several other sites. Since notifying the winners, Google has realized its error and backtracked, telling those cynical winners that their entries actually didn't comply with terms of service and would thus be disqualified. 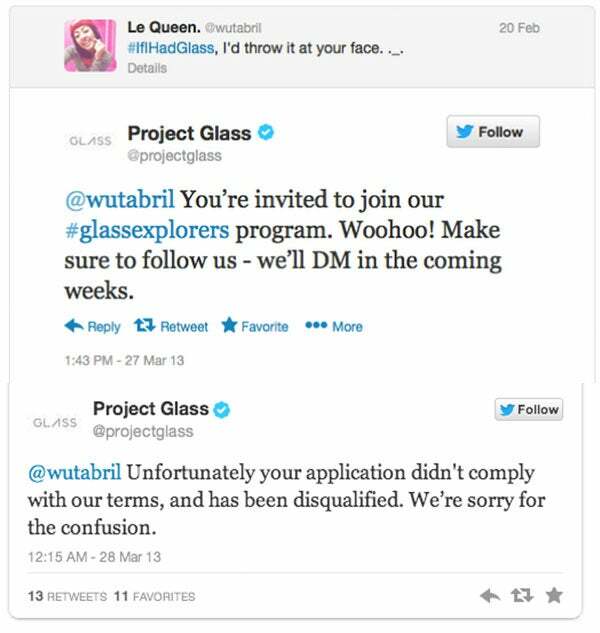 "We need honest feedback from people who are not only enthralled and excited by Glass, but also people who are skeptical and critical of it," the company said in a post on Google+. "That said, it’s become clear that a few applications that don’t comply with our terms have slipped through the cracks, and we’re going to have to disqualify applications like these." Image: Via NYMag, Via CNet.